What is a square? A square is a shape with four equal sides and four right angles. But what happens when a square is forced to break out of its boxy, confining shape? Though it starts out as a perfect square it can transform into something else entirely, something beautiful and perfectly amazing. "It was a perfect square. It had four matching corners and four equal sides. And it was perfectly happy." One square. Unlimited possibilities. One bright red square starts out perfectly happy. But then something happens. On Monday, the square gets cut up and punched with holes. Though no longer a perfect square, it transforms into something just as wonderful...a babbling, giggling, clapping fountain. On Tuesday, the square (now yellow), gets torn into pieces and turns into a garden. Each day of the week something different and extraordinary happens to the square and out of brokenness comes beauty. All the square's colorful adventures cleverly tie together into a perfect and inspiring story. Colors, shapes, days of the week, but with a sophisticated theme that appeals to all ages, I can honestly say that this is one of the best books out this spring. With every page turn my kids wanted to know what was next for the ever changing square. 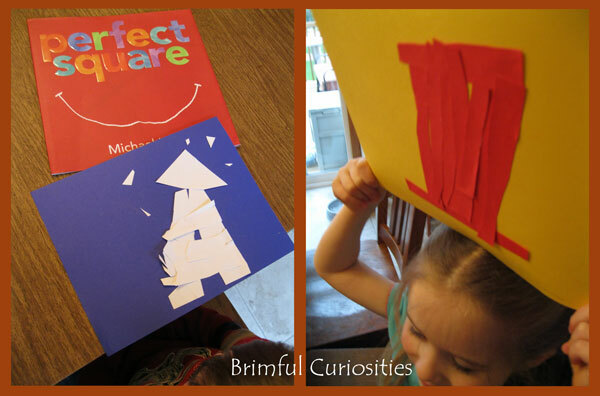 And, inspired by the story, they wanted to have a try at transforming their own square. The book screams for an art project. I love how the story sort of comes around full circle, or rather, in this case, full square with a twist. The "rise to the occasion when forced to break out of your mold" message is probably, for the most part, lost on the youngest crowd but if you know a recent graduate, Hall's book with an adventurous, out of the box message, would make a thoughtful gift for all those ready to embark on a new path in life. Under the Green Willow - "How My Office Manager’s Shoe Left an Imprint on Perfect Square"
I love projects that allow my children to think for themselves and create something new. Hall's book provides the perfect art challenge. 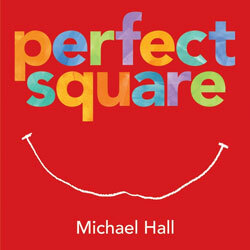 What can you make out of a perfect square? 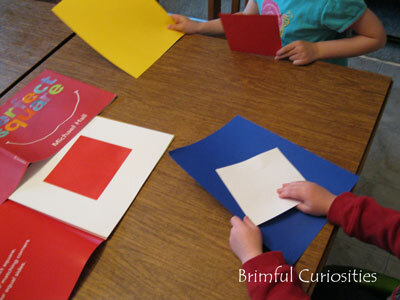 I provided both kids with a square in the color of their choice, cut to the same size as the square in the book. They set to the task, cutting up their perfect squares with scissors and pasting the pieces together to make something different. Here are the results. My son originally wanted to make a lamp but in the end decided the pieces made a better lighthouse (all his own ideas, I might add)! My daughter wishes she could add her hat to the book. Maybe her hat could land on the head of someone standing by the fountain? We have to read this book! Sounds great. I love their projects! This looks great! Thanks for the review. I think my kids and my architect husband would adore this one. I'll bet my girls would love this one. It's fun to see how you expanded on it. What a fun book and activity! There's so much room for creativity here. I love the ideas your kids came up with. This is the second positive review I've read for this book so we'll have to check it out. I just hope it's not too abstract for my kiddos. Fun activity! This sounds like an amazing book...I would love to share it with my art group! 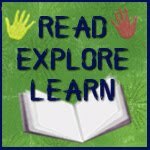 I love your project too, I always enjoy activities that let kids explore their own creativity! Sounds like a good book, and it looks like you had a lot of fun with it! This looks fabulous! You always find the best book. I like the idea of giving this one for a graduation gift, too. Thanks so much for linking up to RAT! Oh my the book looks BRILLIANT! I so want to read it with my kids now. How wonderful! And love your creations!! 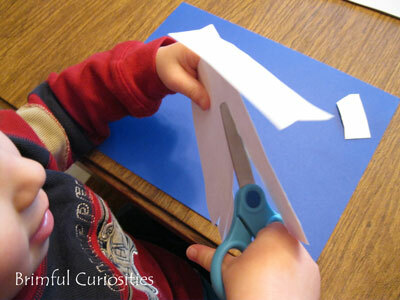 Thanks, as always, for linking up to Kids Get Crafty! You are fabulous! This book looks wonderful. We'll have to look for it. I like the project you did to go along with it. This is a wonderful book! 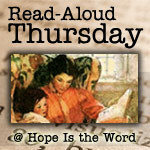 Last week I saw the book @ the library. Checked out the book, being impressed by the cover page!